1. Tip the biscuit crumbs into a bowl. Add the baking spread and mix in. Spoon the crumbs into the base and about halfway up the sides of the tin to make a pie shell. Chill for 10 minutes. 2. Melt the chocolate gently in the microwave then mix in the Carnation Caramel. Beat until smooth. Spread the filling over the biscuit base and chill for about 1 hour, until firm or until ready to serve. 3. Slice the banana and fold half of them into the whipped cream and spoon over the base. Decorate with the remaining bananas and dust liberally with cocoa powder. Recipe contains gluten, soya and milk. I made a lighter version using a sweet pastry case (purchased) and Dream Topping instead of cream. Adjust the milk to make the topping as thick as you want. I used skimmed milk as well. Still tasted luvly but lighter. The second only dessert I've ever made and it turned out spot on. Brilliant! Hi Caspa1946, We do not recommend boiling the Carnation Condensed Milk cans as bursting may occur. Try Carnation Caramel instead. We've done the boiling for you! Hi. I couldn't find any carnation caramel in the shops. Can I make caramel as for the classic banoffee pie and add the chocolate? Or am I better to boil a tin of condensed milk as directed in other recipes? Thanks!! Hi Natalie, this simplest solution is to boil the tin as this will give you a great caramel! Can i use dark organic chocolate 70% cocoa? Or can i use plain chocolate instead? Hi Heather, you can use plain or 70% cocoa - both are good, depends on how chocolatey you like it! Hi Rachna, no just chill it in the fridge - not the freezer. 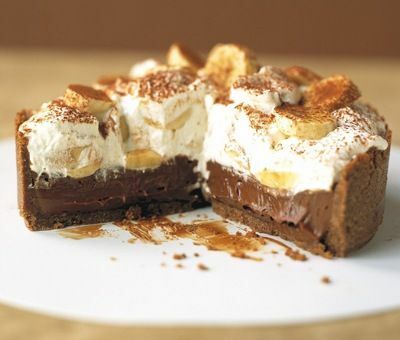 Cheats Chocolate Banoffee Pie is rated 5.0 out of 5 by 2. Rated 5 out of 5 by Marton Mouse from Quick Dessert Friends called in and I didn't have anything but this was made in a jiffy. Rated 5 out of 5 by Ceri77 from What an easy and amazingly tasty recipe! I loved this recipe and so did the family. Carnation products are so versatile they make recipes so simple and tasty. Everyone loved this recipe in my house and it's so simple even the kids can make it with you.